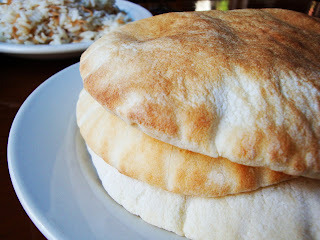 Feelings: After checking out our new apartment, we stopped at a Lebanese restaurant, Tripoli on Atlantic Avenue. There are so many renowned middle eastern restaurants on Atlantic, but I thought we should give this one a try since it seems least intimidating on the block. Usually that is not a good sign. Also, the completely empty space on Saturday is really not good. One immediately notices the high ceilings, wooden carved chairs and stairways, murals, and large windows and mirrors. It lives somewhere between elegant dining and a touch of Astoria gaudiness. I am trying to move out from Astoria, and there we were, we found a taste of Queens in my new neighborhood. The servers were somewhat uncomfortable and gave us an awkward vibe but were very attentive and kind. It is also BYOB, which is always a good thing. I was mainly excited about their large vegetarian selections. I can usually pick one or two dishes at regular restaurants, but here, I had to actually think about what I wanted to eat. Now I understand why people take such a long time to decide what they want to order. I thought they were just being amusingly indecisive. 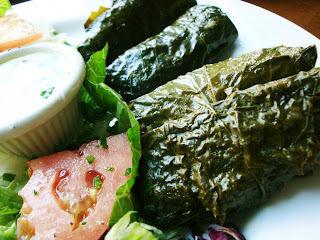 After 10 minutes of using the part of brain I almost never use, I ordered rather uninteresting vegetarian grape leaves, and RB ordered the more exciting shish barak. 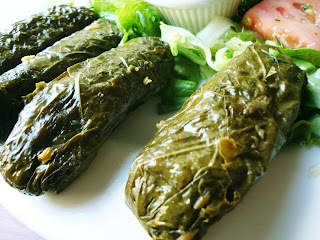 My grape leaves were flavorful and not too oily. All the vegetables were extremely fresh, which made the dish very hearty and refreshing. The slices of tomato on my place were unexpectedly delicious and sweet, a rarity of tomatoes these days. 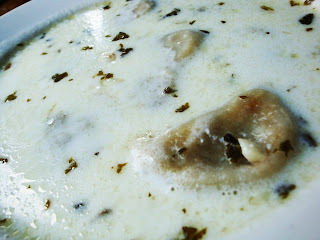 RB's shish barak, small meat-pie dumplings, cooked and served in yogurt sauce made with cilantro and garlic, looked intriguing. The sourness of yogurt made an interesting sauce for the tender beef dumplings. The side of rice was also delicious and perfectly cooked. He said with excitement, "It tastes like what I always wanted Rice-A-Roni would taste like." I cannot wait to move to the neighborhood and try more of their vegetarian dishes, and RB can have more of his perfect Rice-A-Roni he's always dreamt of. Glad you liked Tripoli, I've passed it a million times but have never gone in. My favorite Middle Eastern on the block is Waterfalls. really delicious and also lots of veggie options. the service can be really bad though.